← Your Holiday Eating Buffer…. Decisions Decisions… Are They Affecting Your New Years Resolutions? So we are day 10 into the new year, and your New Years Resolutions for 2013! Have you kept yours? If you answered “No” don’t feel bad, four out of five people will break their resolution. And 1/3 of you will not even make it until the end of January! The most common resolutions for 2013 revolves around weight loss and exercise, shocking I know! When talking with clients at Family Practice Group, some of them are losing ground with their lifestyle changes. 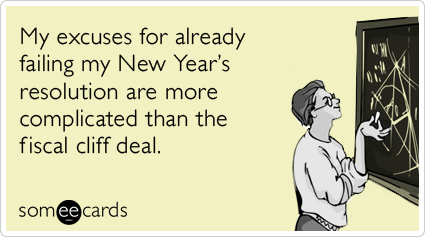 I am not a big believer in resolutions, I am more of a lifestyle change kind of gal. But not matter what you call them or what time of year it is, it’s still a problem if you can’t adapt and make them permanent. I can bet that many of you are just like my clients and myself. When we make a slip in our goals/diet, it most often is at then end of the day. Coincident, I think not? There actually may be a reasonable explanation for this beyond willpower, I like to call it Food Decision Fatigue. The recently coined phenomenon known as “decision fatigue,” is where humans have a limited amount of willpower for making smart choices, and that willpower is depleted throughout the day. Food Decision Fatigue is exactly the way it sounds. 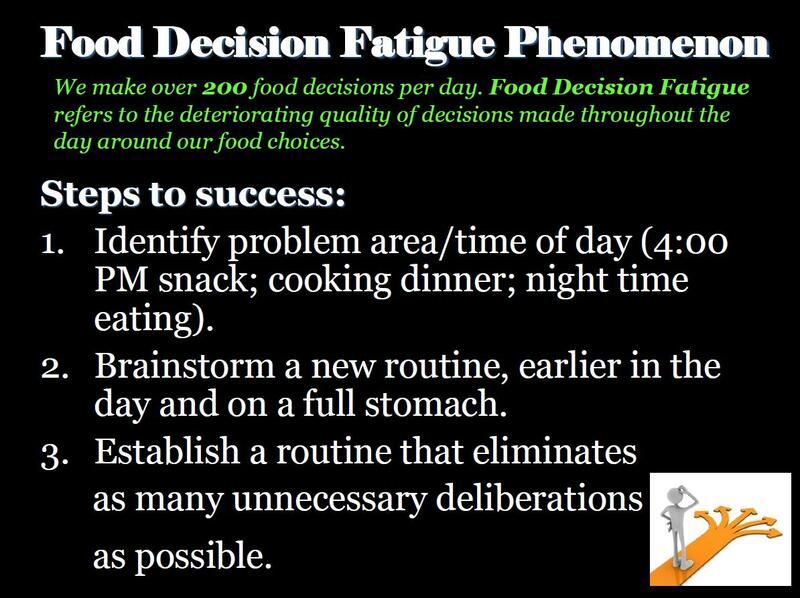 You make over 200 food decisions a day so when the clock hits 4:00 PM, you are tired of saying no and mentally fatigued. No wonder then a trip to the vending machine or a cookie on the counter sounds like a perfect pick me up, however consequences of how that choice will affect your waistline or health goals doesn’t even cross your mind. To over come this phenomena there is an importance of planning and establishing a routine that eliminate as many unnecessary deliberations as possible. And when creating these routines do it earlier in the day and on a full stomach, you will make much smarter choices that will stick! A recent client of mine, Julie has decided that her new years resolution for 2013 was no more eating after 8:00 PM. After about 4 days of teeth gritting and digging her heals in, to hold her own, Julie was obsessing about eating at night. She returned to her old ways of pour herself a glass of red wine followed by her after dinner snack that always started out as 5 crackers and 1 slice of cheese. But ended as block of cheese, a box of crackers and sometimes even the whole bottle of wine! Willpower wasn’t working and Food Decision Fatigue was winning. What did Julie need to do? Create a new routine to and take away as many decisions about food at the end of her day as possible. Pre-plan her after dinner snack for the week, every Sunday morning before grocery shopping. When she arrives home from the grocery store, pre-portion out her evening snacks into snack size bags for the week. Immediately after the snack Julie will go brush her teeth. Julie problem wasn’t that she ate after 8:00 PM, it was the amounts she was eating due to a little alcohol and Food Decision Fatigue. (The rule that eating after 8:00 PM will make you fat, is a nutrition myth made famous by Oprah. You can eat after 8:00 PM and not gain weight if the calories you choose fit within your goal for the day. The reason not to eat late at night is our poor decision making on what and how much we eat, aka Food Decision Fatigue.) This time around Julie was smart, and realized giving up the night time snack was too lofty of a goal for her right now. She knew however that she could make sensible choices ahead of time and that would set herself up for success. My Challenge for you this week is to take a step back and looks at your New Years Resolution. Ask yourself “Is Food Decision Fatigue interfering with my success?” If yes, create a new plan and take away as many food decisions at the end of your day as possible, by following Food Decision Fatigue Phenomenon 3 step plan! This entry was posted in Inspiration, Mindful Eating, Snacking, Social Eating, Uncategorized and tagged food choices, Food Decision Fatigue, New Year, Resolution, Social Eating, weight health, Weight loss, wellness group, years to my life. Bookmark the permalink. 2 Responses to Decisions Decisions… Are They Affecting Your New Years Resolutions? Great article! Keeping focused after 4 is the hardest part!